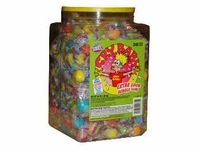 Cry baby sour bubble gum in assorted tangy sour flavors. Lemon, Cherry, Apple, Berry, Orange, and Watermelon. These gumballs are so sour they will make even the macho men cry, but stay with it this gum will only make you cry for about 40 seconds or so. Hang in there you can do it. For another favorite sour gum don't forget about Sour Razzles . If you also love sour candy we have a great selection just for you Warheads are another extremely sour favorite along with Sour Patch Kids or try one of our pucker up Candy Gift Baskets full of all your favorite sour gum and candy.